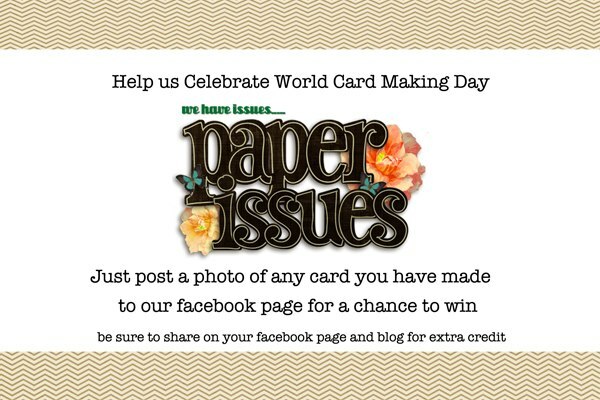 Today we are celebrating World Card Making Day! Ha! I never knew there was such a day, but there is! Card markers are invited to Paper Issues on their Facebook page and link up all the cards they are making for a chance to win some Paper Issue Store Gift certicates! SCORE!! And if you use my coupon code of JUSTME when you check out, you can save on your order as well! Now, I am not a card maker. My cards are usually simple and somewhat awkward, like myself. But I wanted to send my Mom and Dad card, so I whipped this one up. And turns out, I used some flair on it as well! The papers I used on this card are a mishmash of past Studio Calico kits. The thickers are from Gossamer Blue. And the flair? Those came from our Paper Issue Sponsor, A Flair for Buttons. So that means I can link it up the Paper Issues Fall'n for Flair theme challenge, and get entered to win a flair giveaway! Thanks for stopping by! We are experiencing our first freeze tonight, so I will be indoors crafting to get out of the cold! I will be posting all the cards I make today on the Paper Issues Facebook page. Come play along as well! What a fun Miss You card - love the letters and the heart O! Happy Card Making Day! Fab card and I love the color combo! That's very cute. Love the color combo too.